Going to the cottage has become part of my morning ritual. My soul has come to rely on it in much the same way as my body revels in morning coffee. Thus, sitting in my cottage rocking chair while watching the sun rise and sipping a hot cup of coffee has become this summer’s version of heaven on earth. This morning it occurred to me that a mere two years ago the cottage didn’t exist. In fact, two years ago, the only thing that did exist was the land and my growing desire for “a bench or something” where I could sit outdoors and meditate. As I allowed my desire to grow, the “bench” grew first into a glider, then into a gazebo, then into a “shed,” and finally into a fully-insulated, all-weather structure with a sleeping loft and its own electrical service. Oh, and let’s not forget the 100-yard path of stepping stones that keep my feet dry as I pick my way through the woods on dew-soaked mornings. Wow! That’s some meditation bench! The manifestation of this cottage feels like a miracle on many levels. It’s something I dreamed up, planned, and paid for myself. It was built by me, my family, and friends. I hired no one to help. It’s truly a labor of love. On an outward level, I learned to use power tools, pound nails, install siding and decking, shingle a roof, hang drywall, and much more. On an inner level I learned how to admit my shortcomings, ask for help, allow others to be in charge, and accept without guilt the amazing outpouring of love from so many of my friends and family. 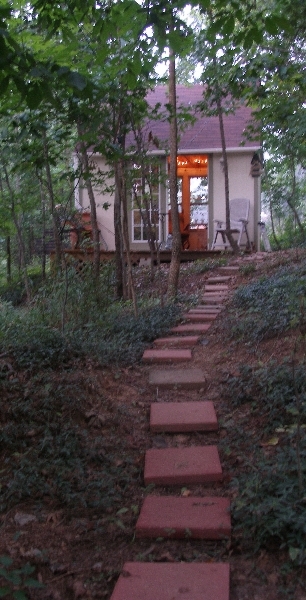 The manifestation of my cottage from desire to reality has been a spiritual journey for me. I mention it now because it will no doubt appear in or be the topic of future blogs. I mention it, too, so you’ll know where I am as the sun’s coming up.